Ale and Compass Restaurant – the new table service restaurant at Disney’s Yacht Club Resort – is slated to open on November 26. 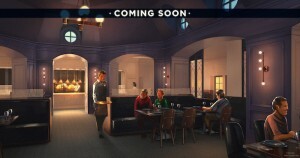 The new restaurant replaces the former Captain’s Grille, which closed earlier this year. Guests will be able to enjoy breakfast, lunch, and dinner at Ale and Compass – and the restaurant is part of the Ale and Compass “theme” for the resort, which highlights New England-inspired comfort food. Yacht Club is also home to The Market at Ale & Compass and the lobby lounge is being transformed too. The menus for the Ale and Compass Restaurant includes Salted Caramel French Toast and Grilled Oat Cakes for breakfast, Lobster and Corn Chowder and Hearth Oven Pies at lunch, and a Coastal Clambake for dinner. Check out all the menus here. Advance Dining Reservations are currently available for dates beginning November 26.